50 years ago yesterday, Tommie Smith and John Carlos walked to the podium at the Mexico City Olympic Games to receive gold and bronze medals in the 200 meter sprint, Tommie Smith having set a new world record in the process. Just another medal ceremony among many. Except this one would become an iconic moment in sports – and, arguably, world – history. Smith and Carlos were students at San Jose State University. An invitation to South Africa to participate in the Games had prompted a call for a boycott in protest of apartheid, the threat of which caused the invitation to be withdrawn. But black athletes on the U.S. squad still discussed a possible protest against racial injustice in their own country. Earlier that year, Carlos had met with Martin Luther King Jr just a few weeks before the civil rights leader’s assassination. King suggested a nonviolent protest while all eyes were on Mexico. And so, as the American national anthem played, Smith and Carlos silently raised gloved fists. The president of the International Olympic Committee immediately demanded the U.S. send the athletes home, or he would ban the entire U.S. team from further participation. They were stripped of their medals, and instead of the hero’s welcome medal winners might have expected, they received hate mail and death threats. They were banned for life from the Olympics, they found it hard to find employment, and their families suffered. They paid a heavy price for their peaceful protest. But so did the silver medalist, whose name is not, perhaps, as well known. Australian Peter Norman unexpectedly won a medal, breaking the Australian record for the 200m in doing so. But like his fellow athletes, instead of being welcomed home as a hero, he too suffered for his actions on that podium. The reason? If you look at the photo, you’ll see all three athletes wearing white badges, representing their support for the Olympic Project for Human Rights, which Norman asked if he could wear as a sign of solidarity with their protest. Refusing to decry Smith and Carlos’ actions upon his return home, he was also banned for life by the Australian Olympic Committee. In 2008 Smith and Carlos received the Arthur Ashe Award for Courage. 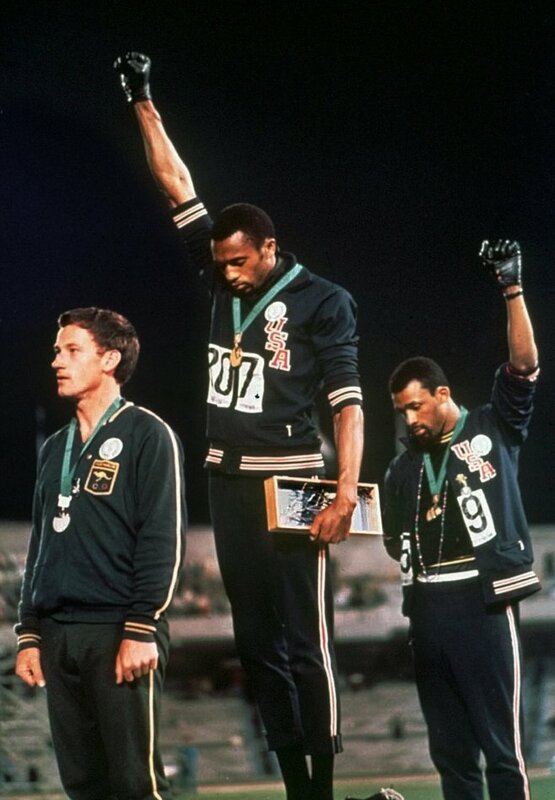 But ten years later, on the 50th anniversary of their iconic gesture, a new generation of black athletes find themselves the target of the same kind of vitriol and hatred as those Olympic sprinters did, for daring to non-violently protest institutional racism in the U.S. while all eyes are on their football stadiums. The insults, slurs and worse that they have endured from the highest level of public office down clearly indicate that there is still a large segment of the American populace that refuses to acknowledge the systemic racism that plagues society, 50 years after the civil rights’ movement. And so, when people protest, some continue to pay the price. Even when the Olympics returned to Australia in 2000, Norman did not receive the customary invitation to attend as a former medalist. When the U.S Olympic Committee discovered this, they invited him to attend as a guest of Team USA. Peter Norman died in 2006. 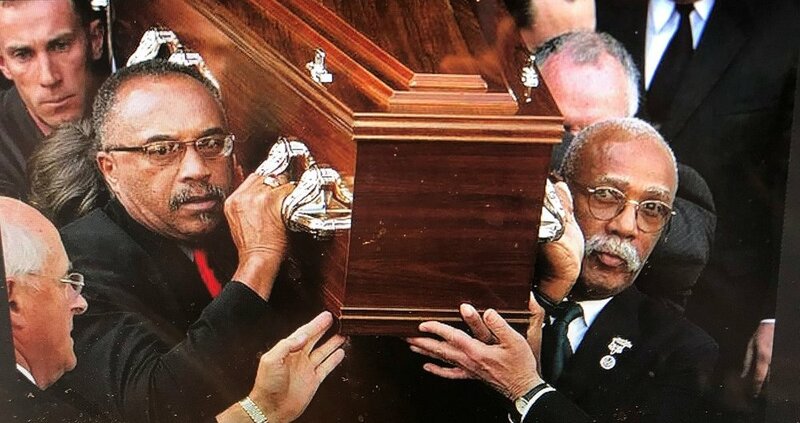 Smith and Carlos traveled to Australia to be among his pallbearers, honoring their fellow athlete and friend. In 2012 the AOC finally issued a formal apology for the treatment he received at their hands, and earlier this year the organization awarded him the Order of Merit, their highest honor. Next year a statue honoring his legacy will be unveiled in his home city, Melbourne. May the same be said of more of us in the fight to end systemic racism, wherever it exists.